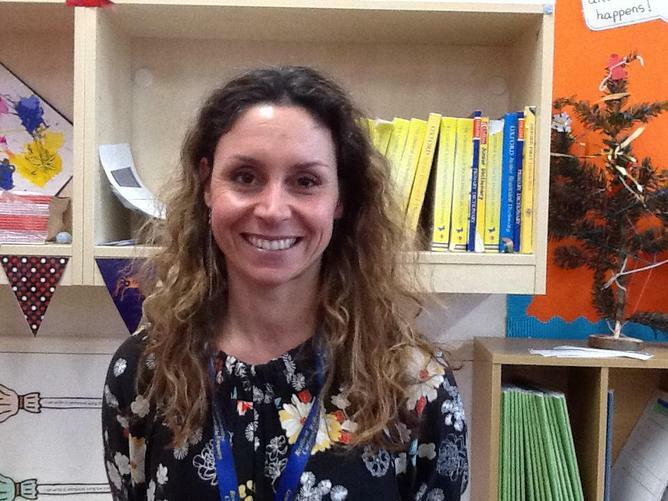 Our teachers are Mrs McKoy, Miss Underwood and Mrs Skoyles. We are a class of 30 fantabulous children, eager to learn! 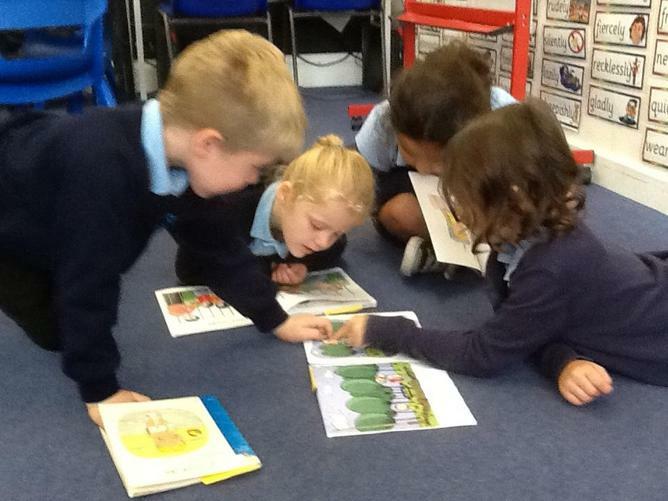 On this page you will see examples of our great learning. Our Forest School/ PE days are usually Wednesdays and Fridays. Please make sure that PE kit and wellies are at school on these days. 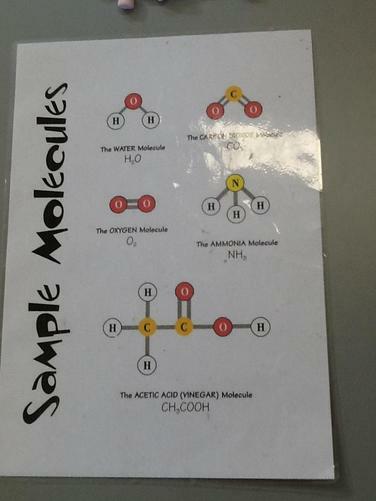 Homework - this is given out every Friday and needs to be handed in by the following Friday. In addition to this, we hope that you are reading every day! 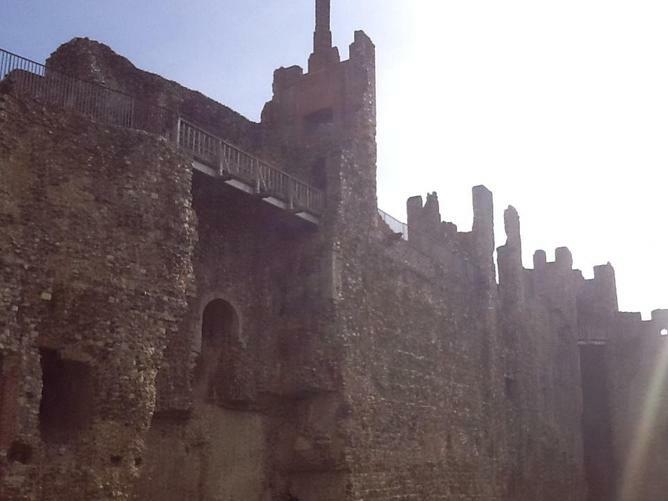 We had a fantastic day visiting Framlingham Castle. 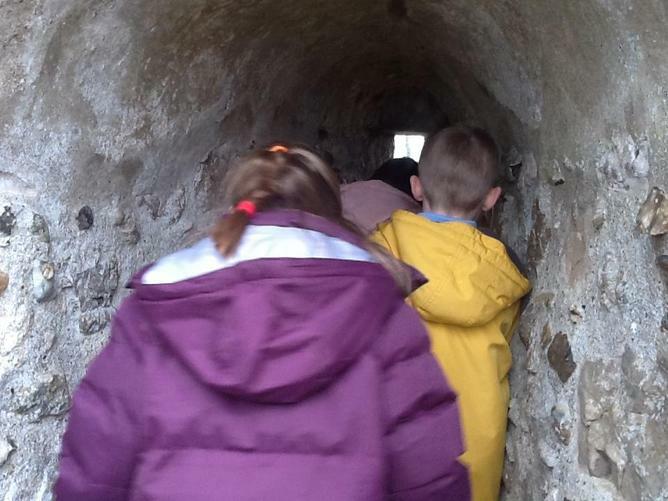 We enjoyed a wall walk and a moat walk. We completed an I Spy activity where we needed to find and draw all the castle features that we have been learning about. 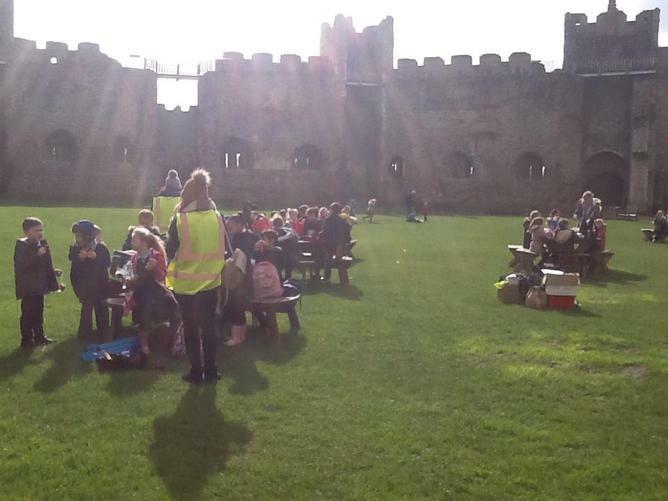 It felt amazing to be there and to eat our lunch inside real castle walls! 1/2/19 Art Exhibition: A Celebration of Colour and Paint. 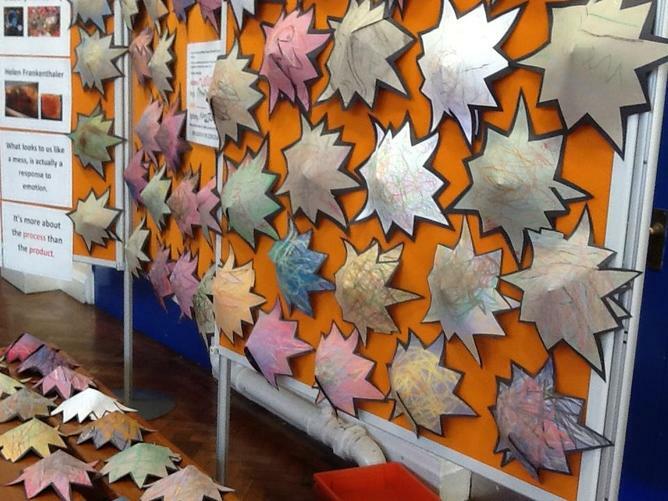 Well done to all of the Year 2 children who worked creatively to produce a piece of art for display. 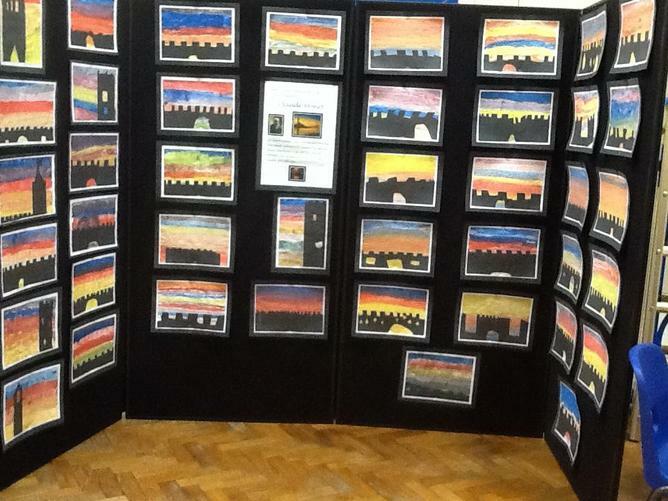 Your castle sunset paintings looked amazing and your teachers are very proud. I'm sure Monet would have been super proud of your sunset skies too! We had a visit from Jack the artist. He taught us about primary and secondary colours. We used primary colours (red, blue, yellow) to mix green, purple and orange! We are going to use our colour mixing skills to create some sunset art in the style of painter Claude Monet this week. We can't wait to get started! Today we put on our lab coats and explored chemical change. 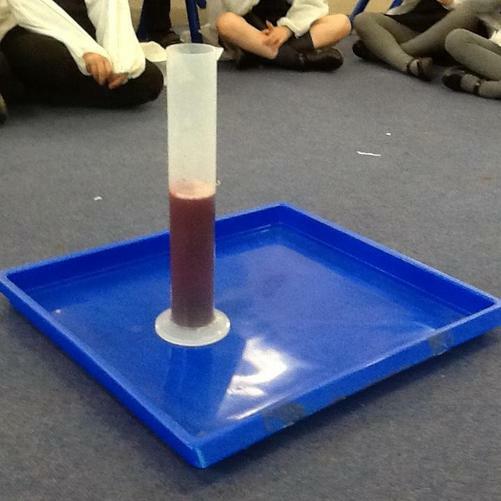 We mixed vinegar with a little bit of red food colouring and some bicarbonate of soda. 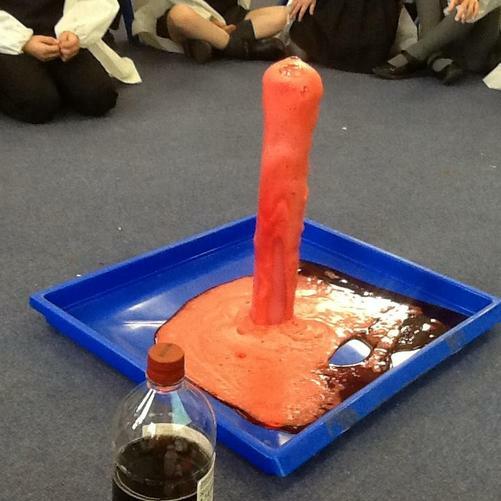 The vinegar reacted with the baking soda and caused a chemical reaction - we watched it explode like a volcano! 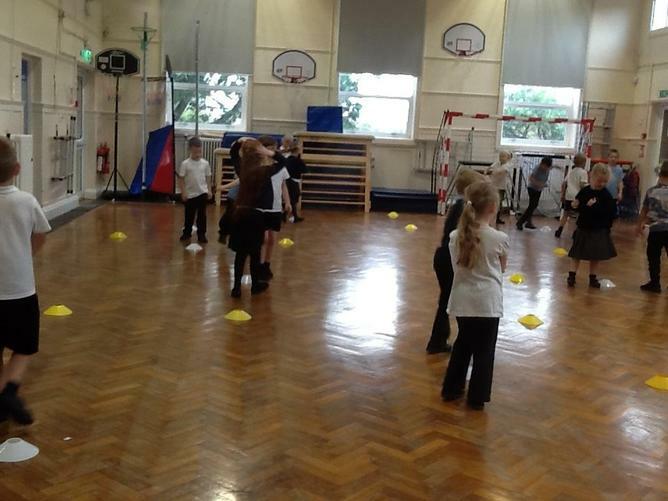 We have been learning some new games in PE, as well as using equipment to make up some of our own! 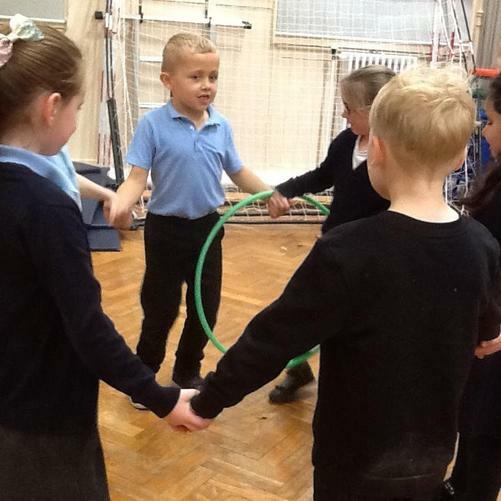 Today we had to work as a team to get the hoop around everyone - without letting go of hands!! We had to be very collaborative and help each other. Did you know that raisins can dance? Well they can! We carried out an experiment with still water and sparkling water. 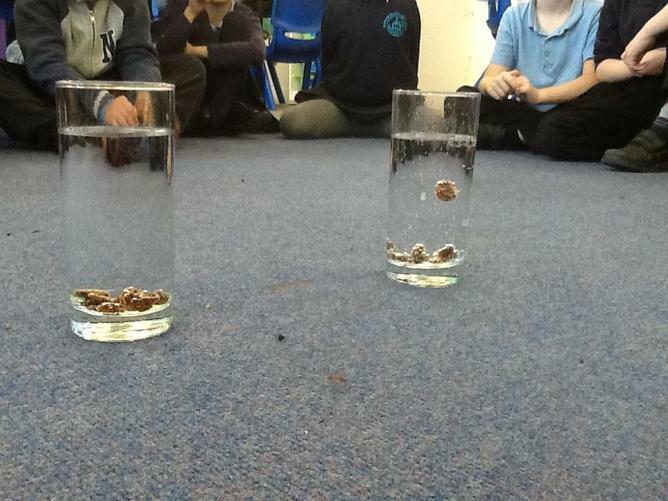 When we put the raisins in the sparkling water, at first they sunk to the bottom. Then they began to rise to the top and back down again - it's like they were dancing! 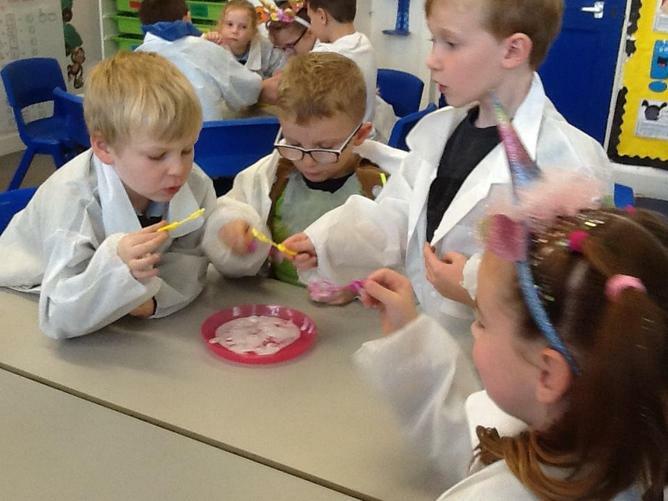 31/10/18 Mad Science - BUBBLES! 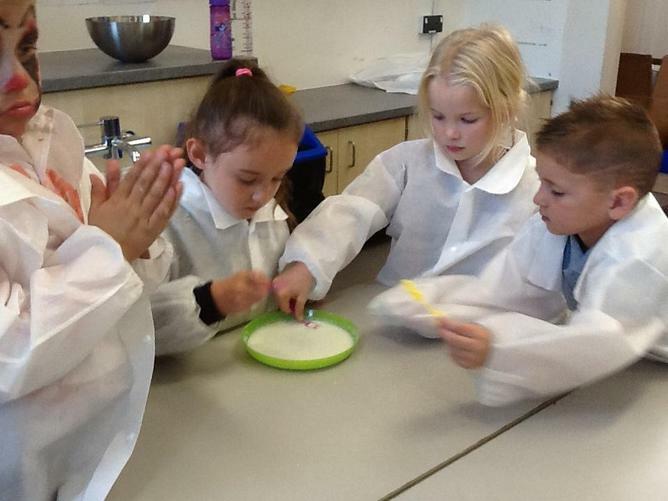 Year 2 had fun being scientists today - we experimented with different solutions to find which made the best bubbles! 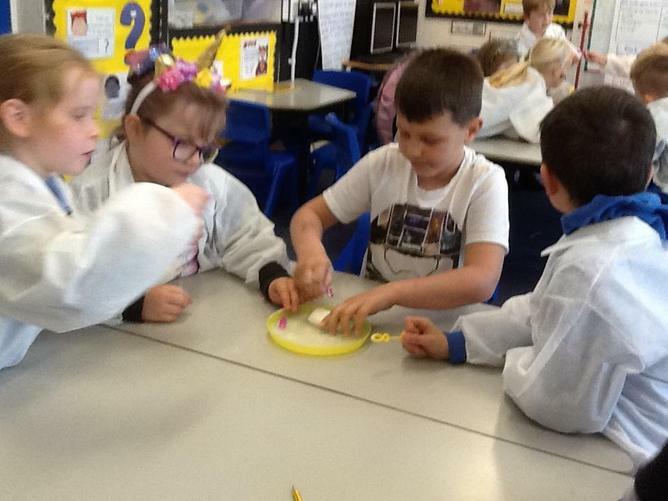 We made a prediction, then tried it out using milk, water, washing powder, washing up liquid, shampoo, squash and soap. We found that the best bubbles were made with washing up liquid and shampoo. We are wondering why, so the children have gone home tonight to check the ingredients and see if washing up liquid and shampoo share any of the same ingredients! On Monday we welcomed our family and friends into our classroom and we showed them ways to make maths learning fun! We read 'Spinderella' by Julia Donaldson and we played some maths games on the interactive whiteboard. We then enjoyed different games and activities on the tables. We learnt some new things and certainly did have lots of fun! A big thank you to everyone who was able to make it! We are trying to build up our reading speed. We are practicing every day with a partner. It's good to read with a friend because they can help us when we get stuck. 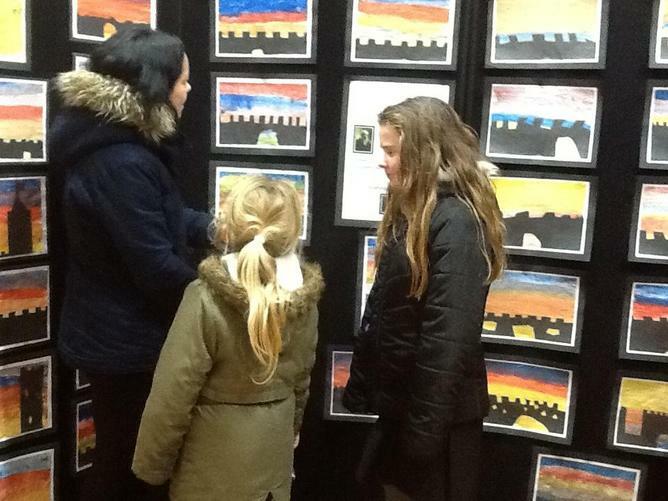 We were so proud to show off our art work at the exhibition on Friday. 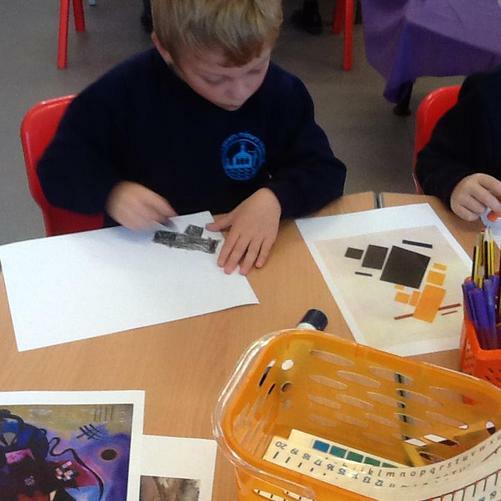 During art week, Jack taught us all about drawing different lines using different tools and we listened to music. We drew how the music made us feel. 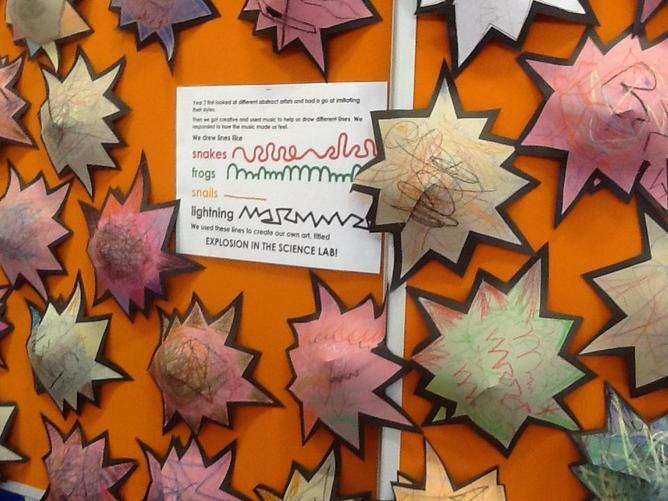 We produced some pieces of art entitled 'Explosion in the Science Lab'! We are really enjoying having Mark visit us every Tuesday. He has been teaching us large ball skills. 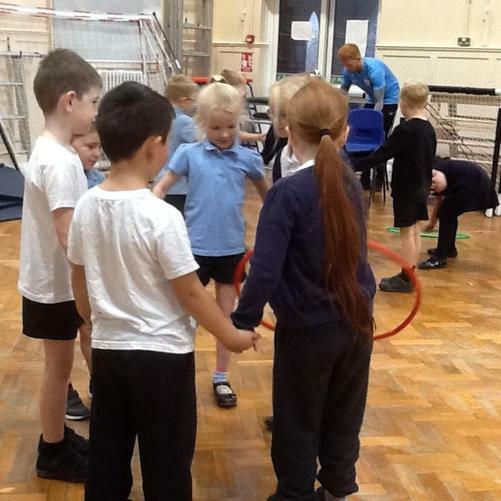 We are learning to control the ball with throwing and catching, kicking and dribbling. We are learning a lot about keeping our bodies fit and active. 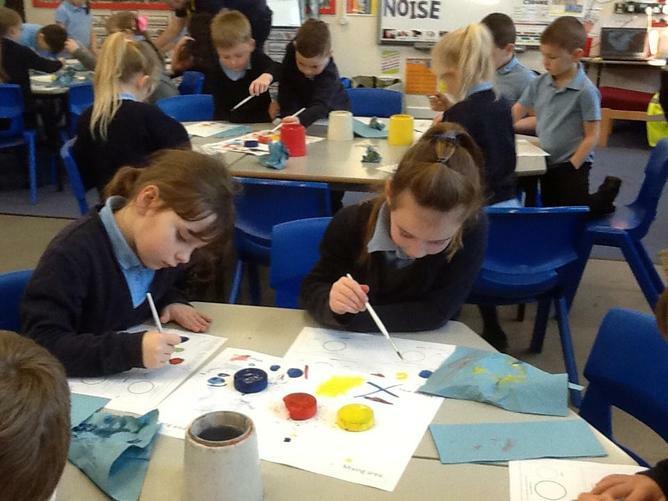 Year 2 have been very creative over this art week. 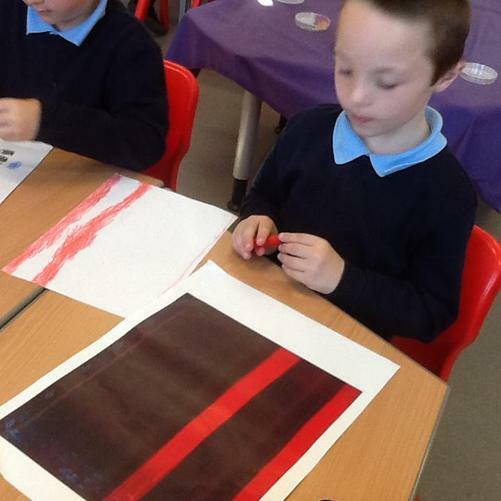 We have been looking at abstract expressionist art. We have used music to inspire our lines and choices of colour. We have been experimenting with different drawing tools - pastel, chalk, charcoal, crayon and pencil. We can't wait to show you our creations at the Art Exhibition next Friday 5th October! 7/9/18 Year 2 Mad Scientists! 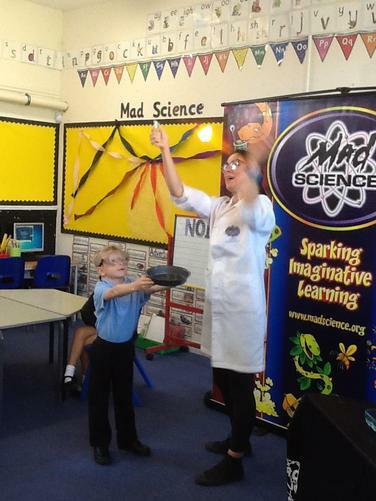 What an exciting start to our learning in Year 2 - we had a visit from Dr Dee Enay, the Mad Scientist! She taught us all about chemical reactions. We learnt that this always means a change of some kind. We learnt lots of new scientific words, like molecule, atom and bond. 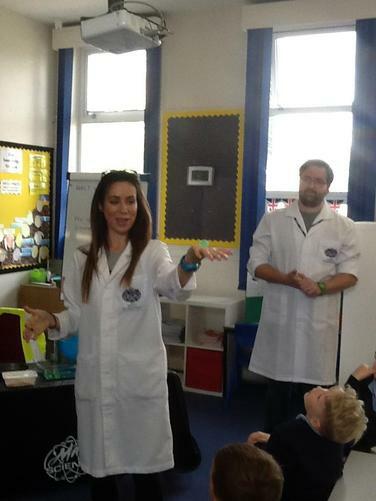 Dr Dee Enay left us our very own lab coats and she also left us with a challenge - to create our own Mad Science show to share with our friends and families!! We gladly accepted the challenge... so watch this space for the Magnificent Year 2 Science Show!